If you can't accurately draw something that is right in front of you how can one expect to accurately render something that is in one's head? Drawing is 90% seeing...paying attention to subtle details...finding 'markers' to gauge proportions and making corrections to the sketch (instead of reinforcing the errors by merely outlining what you drew wrong to begin with). If you are drawing something that you are visualizing, it is still important to be able to 'see' it clearly in the mind. Students are often resistant to life drawing and think that they do a better job drawing make-believe items. They often say this because someone that might be 'judging' their work can't climb in their brains and see how accurate they are or are not. Life drawings are more concrete when evaluating...are the angles correct? scale? proportion? values? As they struggle through these issues (if they are focusing and taking the issue seriously) they improve in both life and imaginary renderings. But focused practice and practice tend to be two different things. If the teacher is the motivation, then their work tends to be several notches above what they do at home...and any improvement is usually temporary at best. Drawing is a skill and must be practiced to be maintained and improved upon! 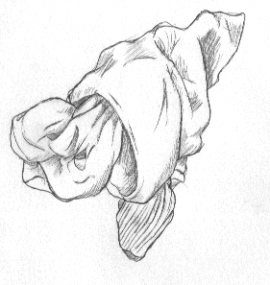 One of the best exercises for drawing is to take socks, twist them up, and spend about 5 minutes doing quick sketches. Trees also tend to be a great practice item. Again, it is important to pay attention to the details and practice 'seeing'. It is very easy to spot a drawing where someone is 'generalizing' and not drawing what is actually there. More on the importance of life drawing and the dreaded 'design creep' in a later post.